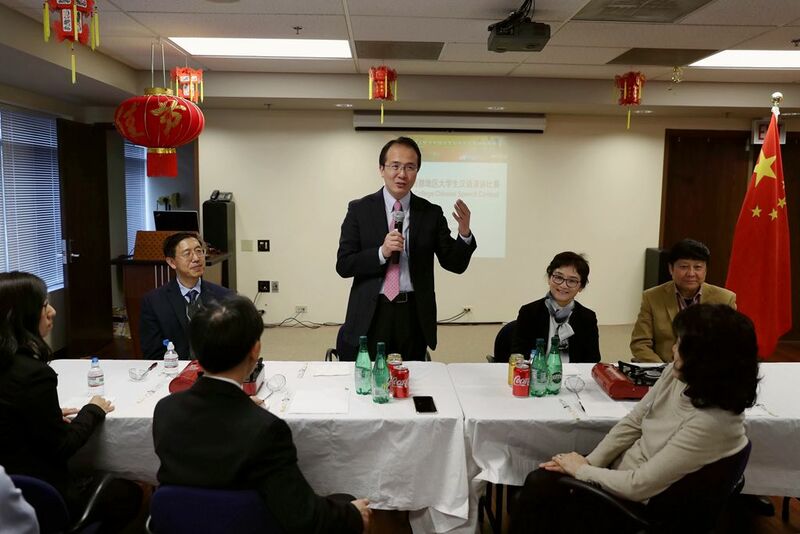 On April 21, 2018, Consul General Hong Lei attended the welcome dinner for participants of the 2018 US Midwest Chinese Bridge Speech Contest. Contestants, judges and teachers from 11 universities in Minnesota, Wisconsin, Iowa, Illinois, and Indiana attended the dinner. Deputy Consul General Liu Jun and Counselor Chen Yinghui for Education affairss also joined the dinner. In his speech, Consul General Hong Lei warmly congratulated the participants for their achievements in learning Chinese. He commended their excellent performance in the contest, and thanked the organizing committee, judges and teachers for their hard work. Consul General Hong Lei pointed out that languages are an important bridge of communication that connects different nations. Learning another language is like opening a door of understanding and friendship. By studying Chinese, US students have opened a door to understanding China. I hope that Chinese language learning can always be a part in the contestant students’ lives. It is hoped that the contestant students can appreciate the beauty of the Chinese culture, contribute to stronger China-US ties, and drive forward the healthy and stable development of bilateral relationship. Consul General Hong Lei said that China and the United States, as the largest developing country and developed country respectively and permanent members of the United Nations Security Council, have significant influence over world peace, development and stability. In the past 40 years since the establishment of diplomatic ties, the relations between China and the United States have developed rapidly and the two countries have developed enormous common interests. Given the huge common interests, cooperation is the only option for China and the US. Consul General Hong Lei pointed out that curently there is a major debate on America’s China policy in the US. The core of this debate is the US perception of China and the future direction of Sino-US relations. This debate will have long-term bearing on the development of our bilateral relations. In this debate, there are some voices and views that we disagree with. For example, some people want to treat China as a strategic rival of the United States. Others believe that China is taking advantage of the United States in international trade. Some even argue that Chinese students studying in the United States demonstrate Chinese “sharp power” and “sharp influence” in the United States. We believe these views are prejudiced and erroneous. Consul General Hong Lei said that according to the goals put forward by the 19th National Congress of the Communist Party of China, in the next 30 years, China will strive to build itself from the world’s largest developing country into a moderately developed country. The primary goal of China’s development is to improve the lives and well-being of the Chinese people and enable them to lead a better life, instead of challenging the international status of the United States. Consul General Hong Lei stated that President Xi Jinping delivered a keynote speech at the opening ceremony of the 2018 Boao Forum for Asia, reviewing the extraordinary experience of China’s reform and opening up in the last 40 years, declaring China’s firm determination to deepen reform and opening up, as well as specific measures in this regard in the new era. These measures include improving market access and investment environment, strengthening the protection of intellectual property rights, and taking proactive measures to increase imports. These policies demonstrate China's sincerity in cooperating with international partners to create a better future for Asia and the world. They also showcase China’s sense of international responsibility as a great power. China’s development will create more opportunities for the United States, rather than posing a threat to it. Consul General Hong Lei stated that the understanding and friendship between the young people of China and the United States are an important foundation for the future development of Sino-US relations. 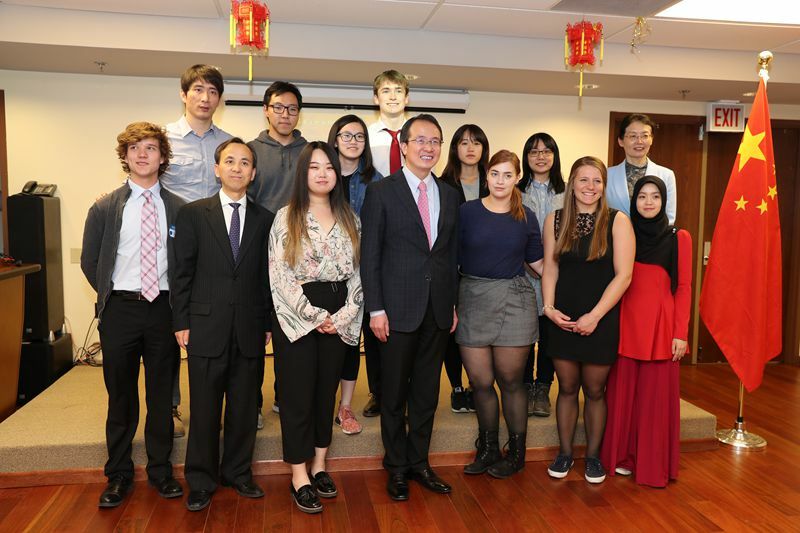 The Chinese side supports Chinese students to study in the United States, befriend with their American peers, and foster a broader base of friendship between the two peoples. We also hope that relevant parties in the United States will answer the call of American students to understand China and learn Chinese, and provide support for American students rather than creating unnecessary obstacles. Consul General Hong Lei stated that China and the United States should always seek to maintain and expand their common interests and commit themselves to strengthening partnership between the two nations. It is imperative that the cold war mentality should be abandoned and in that way, the two nations can overcome the “Thucydides’ Trap”. The two nations need to adopt rational and pragmatic perception and treat each other with respect. The two countries should properly handle their bilateral differences on the basis of mutual benefit and mutual respect. Only then can China and the United States embark on a new path of international relations between major countries in the 21st century. This is in the interests of the two peoples and nations around the world.